Before school care is available beginning at 6:30am. This is a great option for parents who need to get to work early in the morning, or for parents who would like to drop off their child earlier when older siblings go to high school. Mornings are typically low-key with board games, card games, art activities, reading, etc. Breakfast is included and served from 6:30am - 7:15am every day. Enrollment is based on your weekly schedule. Occasionally drop-in care may be available during specific circumstances. Please speak with our office at 279-8903. This program is available for children in Kindergarten through 12 years old. Full-day care is available for days that the public school is closed. This includes snow days. 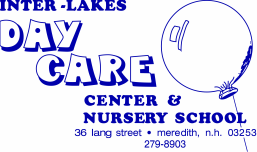 Inter-Lakes Day Care Center typically opens at 6:30 AM, but may open at 8:30 AM or close earlier in the afternoon depending on weather and road conditions. If this happens you will be notified and information will be available on WMUR's website and/or our Facebook page.